Following her stunning illustrative work Greek Myths of Sally Pomme Clayton’s text, Jane Ray has created a fairytale all her own. Ahmed is an orphan boy who lives and travels with a circus. Hard work is familiar to him. He finds a golden egg and watches as it grows and hatches. A girl child is born and Aurelia becomes the feature for a larger circus audience. As she grows, feathers sprout from her body. People flock to see the feathered child in a golden cage. Ahmed and Aurelia form a special bond. 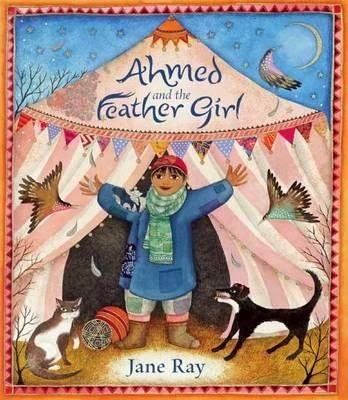 When feathers fully cover her, Aurelia begs Ahmed to set her free. This is not easy. But he does so, and she flies into the clouds. Each night Aurelia visits the boy in his dreams and leaves behind a coloured feather. These he collects till he too has a cloak of feathers, which will lift him up into the sky. This tale can be deconstructed as carrying themes of child abuse and deprivation for monetary gain. Or it can be left alone amidst its beautiful illustrations, reflecting fantasy and childish innocence alive and well, threaded with themes of friendship and freedom, and the longing for a new life.